Some call it the "Holy Grail of Ufology." Some call it a hoax. I call it the Estimate of the Situation, because that's what it's really called and I don't see why these other people keep calling it something else. The EOTS is the very first official document produced by "Project Sign," the U.S. Air Force's very first official attempt to study and define the UFO problem. The document was written in 1949, shortly after a UFO sighting known as the "Chiles-Whitted UFO Encounter" made national headlines and terrified the nation. In this encounter, two airline pilots -- one of them was named Chiles-Whitted, but I'm not sure what the other guy's name was -- sighted a torpedo-shaped object that nearly collided with their commercial plane. What made it even scarier was that their plane was in the air at the time. The Project Sign staff investigated this incident thoroughly and found the report credible. Both Chiles-Whitted and the other pilot were experienced flyers and knew exactly what kinds of things were supposed to fly past their plane and what kind of things weren't. This, combined with their investigations of several other significant recent sightings, led the Project Sign investigators to conclude that UFOs were indeed real physical objects, that they displayed intelligent design and behavior, and that they most likely had an extraterrestrial origin. Those amazing conclusions formed the basis of the Estimate of the Situation. You can probably guess what happened when the report came out, but if you can't I'll tell you. As the story goes, the EOTS was sent upstairs to the curmudgeon in charge of the Air Force, who freaked out, quickly squashed the report and told everyone in the Air Force to clam up about it or else. Apparently that worked. Today, there doesn't seem to be a single copy of the Estimate in existence, and very few people alive can vouch for the truthfulness of the story or that the EOTS ever existed. And that's just how the Air Force likes it. Whether it ever actually existed or not, and I think it did, the Air Force's investigative efforts quickly took a turn for the worse after Project Sign was disbanded and reconstituted as "Project Grudge" -- which has got to be one of the best names for a committee ever. 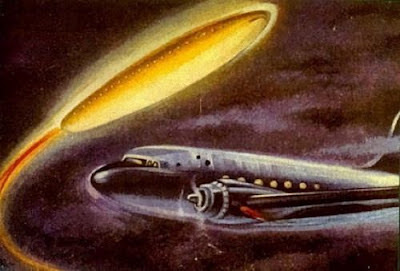 Once Grudge went into business, UFO reports were uniformly dismissed and ridiculed, and UFO witnesses were routinely portrayed as kooks and crazies. "Once the Pentagon had set firm UFO policy and had rejected the historic 'Estimate of the Situation' (which one faction in Project Sign had sent through channels clear to the top), in which it was concluded that flying saucer reports did give evidence of extraterrestrial intelligence, the air force entered upon a long period of unfortunate, amateurish public relations... (T)he Pentagon had declared that the problem really didn't exist."